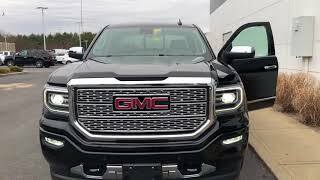 The Sierra 1500 form the house of GMC gets some really great upgrades and is now available as GMC Sierra Denali Ultimate 2016. The package adorns model with some commendable upgrades to steal your heart away. It is something that the boss of your boss will crave to ride. 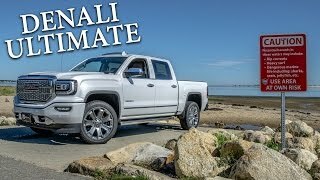 Let us have a look at the review of GMC Sierra Denali Ultimate 2016 to know in details about the model. The interior of GMC Sierra Denali Ultimate 2016 didn’t change practically however a couple of inclusions make it look distinct. Talking about visible changes the model comes with redesigned armrest that features a built-in wireless phone charger. The integration allows you to charge your devices without any mess of cables and wires and is compatible with devices that support wireless charging. Apart from this the major inclusion is on the tech front. The model now features the updated version of Apple CarPlay and Android Auto. All you need to do is to connect a compatible device through USB and the system will give you all access through Apple or Android (which ever suits). 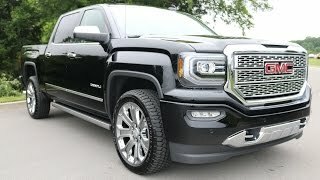 Thus rounding up the interior details of GMC Sierra Denali Ultimate 2016 I would just say though it is being carried ahead but the high-end instincts are definitely worth appraisal. Unlike interior, the exterior of GMC Sierra Denali Ultimate 2016 carries little more upgraded design cues in comparison to the predecessors. Starting with the front fascia there is a newly designed massive grille sitting amidst the new set of headlights. The hood on top and the bumper beneath also features new look making the model look more appealing and modern. Moving towards the rear end, you’ll notice the newly designed Tri-Mode running boards and the massive 22-inch wheels while the rear things remain unchanged with same taillights, bumper and bed. 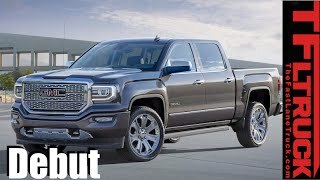 Thus rounding up the exterior details of GMC Sierra Denali Ultimate 2016 all I would say is, the new inclusions make the model look gorgeous and superior. Beneath the hood of GMC Sierra Denali Ultimate 2016 are two powertrain options. The standard engine is a 5.3 liter V8 cranking total output of 355 hp and peak torque of 520 nm while the optional engine is a 6.2 liter V8 generating total output of 420 hp and peak torque of 623 nm. Both the engines pair to a new Hydra-Matic 8L90 eight-speed automatic transmission as standard.